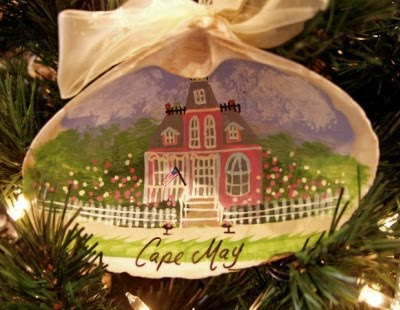 Home / DIY Ornaments / Everything Christmas / Ideas for Homemade Christmas Ornaments -Coastal Style! 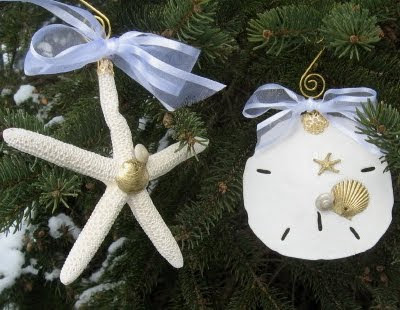 Ideas for Homemade Christmas Ornaments -Coastal Style! Celebrating Christmas with homemade ornaments. 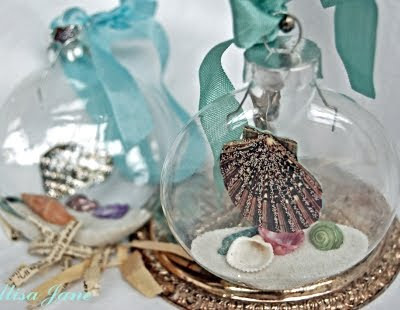 I posted this idea of a clear fillable Christmas ball ornament in an earlier post here: Make a Beach Ornament. This is another beauty, made by the talented Alisa from Life is a Beautiful Place. I love how the shell's dangling -you can do that with a ball that opens up! 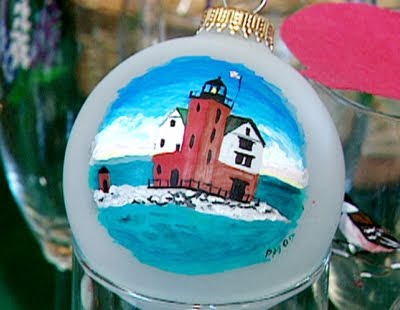 Christmas Ornaments with a Painted Personal Touch via HGTV. Place a frosted glass ornament on a mug or glass, take out your acrylic paints and let the magic begin! Got a few small dritfwood pieces? Transform them into fun Santas! Large Quaogh shells make great canvas. 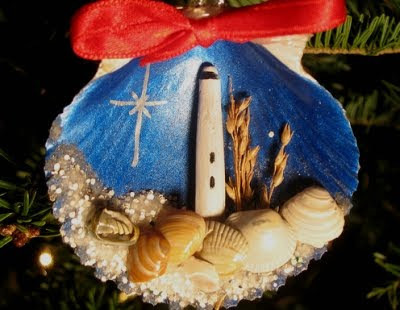 Prime the inside, then paint and you've got an awesome homemade Shell Ornament. 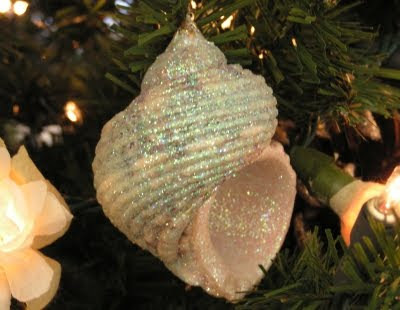 Glittered shells add sparkle! Seen here. 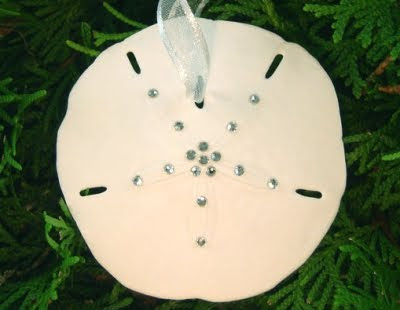 If you were lucky to find a sand dollar, turn it into an elegant Ornament. The sky is the limit to what you can glue onto sand dollars, starfish and shells. Via. Consider yourself lucky if you find an urchin! 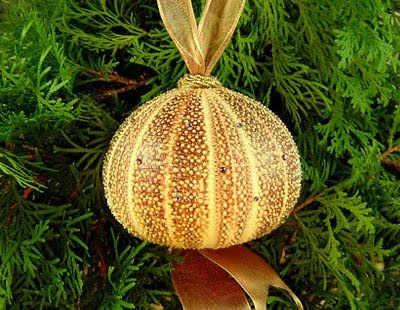 Lightly misted with fine gold glitter and adorned with Swarovski crystals, this urchin is precious indeed. It hangs from a shimmery magenta and gold iridescent ribbon. Via Flickr. 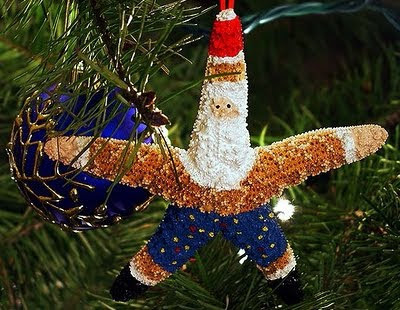 Transform a starfish into a Santa. This would work great with a less than perfect starfish. But do this only if you find one washed upon the beach! 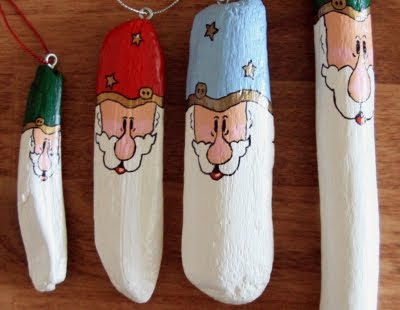 And how adorable is This homemade Christmas ornament! 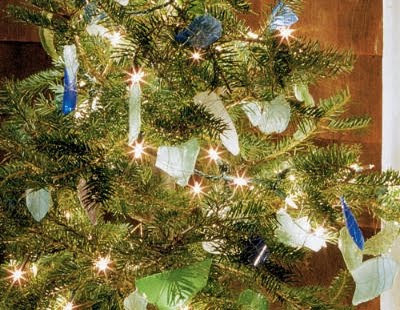 And if you happen to have a sea glass collection, Wrap pieces in wire and hang them as ornaments. Beautiful, don't you think! Via Coastal Living.